2017 marks the fifth anniversary year for The One Step Foundation. As the year draws to a close we hear from Sam O’Brien, wife of the late Sean O’Brien, founder of The Foundation. Sam, how did The One Step Foundation come about? Sean established The Foundation to support and inspire young people, providing them with opportunities to explore career prospects and involving employers as part of the process. Although apprenticeship schemes have been around for centuries, for most of the 20th century there were no major reforms and employers criticised the system as being restrictive and unresponsive to the needs of industry. Apprenticeships have moved on considerably since 2013 and are now seen as a real alternative to university – this is what Sean felt strongly about, providing alternatives for young people that helped them grow and achieve. 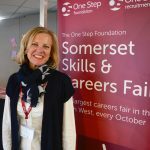 With The Foundation engaging with local employers the concept of the Careers Fair was born and young people’s eyes opened to their full range of options in the South West – both academic and vocational. What was Sean’s vision for the Foundation? The vision was and still remains to inspire and support young people, preparing them for the workplace. The Foundation continues to achieve its objective five years on. Prior to launching The Foundation, Sean felt the full support of his local community following pioneering cancer surgery. He founded Go Commando in 2010 in response to the community’s overwhelming desire to support Taunton’s Royal Marines Unit 40 Commando RM on their return from Afghanistan. Sean built up the charity so close to his heart, chairing it until he was forced to hand over the reins due to ill health. What do you think Sean would make of the Foundation today? Sean would be immensely proud of everything The Foundation has accomplished for the community and how it continues to achieve its primary objective to support young people. The Somerset Business Award (awarded to The Foundation in 2016) means a great deal to all involved with The Foundation and Sean would have been delighted with this acknowledgement. The Foundation continues to support local charities, along with its sister company One Step Recruitment. Together they continue to fund a member of staff for local charity The Wedding Wishing Well Foundation, ensuring the charity can continue operating. The One Step Foundation is more than the annual Careers Fair. It will continue to build on the great work already undertaken, developing and diversifying further with other projects and worthy initiatives that are currently being explored. Thank you Sam for your time and your thoughts.